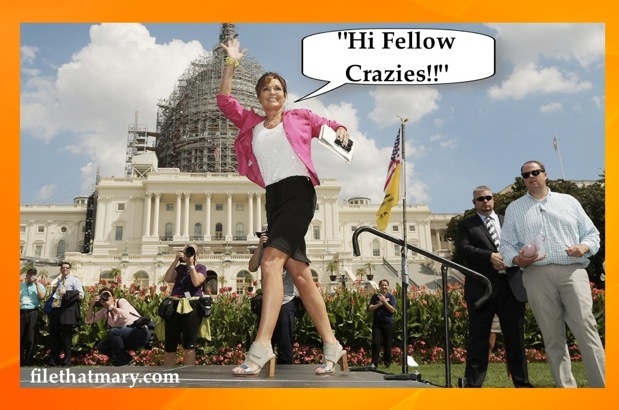 Sarah Titillates And Tantalizes At D.C. Anti-Iran Rally! Wowza! NUTS FOR SARAH” … “SARAH IS THE BOMB”, “NUKE EM PALIN” and “SARAH,PLEASE SIT ON MY FACE“ were just a few of the signs that greeted Sarah Palin yesterday, as she bounded on stage in Washington D.C. to address the crowd at the anti-peace rally, protesting President Obama’s duplicitous sanity-driven deal with Iran. She beamed at the enthusiasm and offered a few more “Obama, blah blah blahs and Obama blah blah blahs, working the crowd into a fever while spittle flew out generously from her slightly moistened lips. Some audience members passed out, a few tore at their hair and some just started whirling in circles. As she was being lead offstage by her handlers she offered one last “Bless you and God Bless America!”, before throwing down the microphone. “That was fun!” Sarah cackled. This entry was posted in GTK, Politics, Whores and Horrors and tagged #GOP, #sarahpalin, #tedcruz. Bookmark the permalink.